Die-off symptoms ,healing crisis, herxheimer reaction and detox symptoms relief. Constipation or digestion issues such as gas, bloating. Ongoing basis to get rid of accumulated waste and toxins in your body. Squeeze the juice of ½ organic lemon and add 1 teaspoon of organic raw unfiltered apple cider vinegar into 16 ounces of distilled water. Drink before bedtime with 4-8 capsules of oxy-powder on an empty stomach away from any foods or other supplements. Oxy-powder releases oxygen in the colon to detoxify and loosen toxins, undigested food particles and waste buildup so they can be flushed out naturally by the body. Learn more about oxy-powder. Expect the next day to have a series of bowel movements with many of the toxins being eliminated. 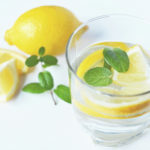 Most people feel a significant relief when these toxins are being flushed out. If you have never taken oxy-powder before, start with 2 capsules and gradually increase if needed. How Well the Overnight Flush Works? Most people report a sense of “great relief” that often comes with increased energy, higher clarity, a clearer complexion, and significantly better bowel movements and digestion, with many digestion issues such as constipation, bloating, body odor and gas greatly improved. These improvements are not surprising considering that waste buildup weight may be 10-20 pounds and sometimes even more. When the body gets rid of such a burden, it has more energy and resources to perform better and to actually heal other areas which were neglected before. 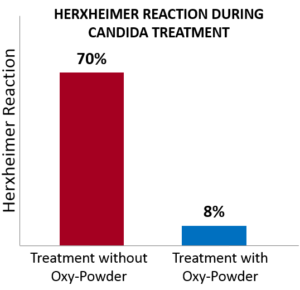 Furthermore, in a survey with 150 systemic candida patients, participants were asked on their die off and healing crisis symptoms (herxheimer reaction) during the candida treatment and whether or not oxy-powder was used. Oxy-Powder made a huge difference: only 8% of the patients who used oxy-powder experienced die-off symptoms! Our high rated experts guide covers how to treat, manage & avoid healing crises and die off symptoms, including assessment of your symptoms and levels of toxins, common critical mistakes to avoid and health risks you must know. Is your probiotic supplement making you sick? Our experts cover top facts you must know before you take any probiotic supplement: how to know if your probiotics are safe, effective, which type to use, and do probiotic foods actually work. What should you eat to heal a leaky gut? The complete gut health diet plan & treatment for leaky gut: best supplements & foods to heal leaky gut, foods to avoid, and the truth about dairy, probiotic, fermented foods and other controversial topics. This easy to follow 5-Step program is specifically designed to address the root cause of candida and yeast issues. It is based on long years of candida detoxification research, combining natural medicine time proven traditional remedies and modern science. Disclaimer: These statements have not been evaluated by the Food and Drug Administration. These products are not intended to diagnose, treat, cure, or prevent any disease. All content of this website is for informational purposes only and is not intended to diagnose, treat, cure, or prevent any disease, as well as provide or replace medical advice of any kind. Reliance on any information on this website is at your own risk. We do encourage you to educate yourself as much as possible, and share this information with your health provider.